Selenium Side Effects - Do Benefits Outweigh The Risks? Some people elect to take a selenium supplement when their diet proves inadequate and this is likely due to the many purported health benefits of the mineral. 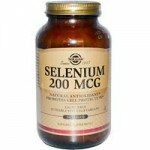 Used medicinally for a wide variety of ails including everything from cancer prevention to heart disease, it’s not difficult to see why many people want to take advantage of selenium supplement benefits, however with any type of medicine, there is a risk of side effects, and this essential is no exception. So, is there a greater benefit to the body than there is risk of selenium side effects? Except in rare cases, it’s very unusual for people to experience a selenium deficiency. This makes a pretty hefty argument against taking any additional supplements of this naturally occurring mineral because if the body doesn’t need it, why add it? Additionally, one of the most severe selenium side effects is selenosis, a literally toxic level of the stuff that can cause some pretty severe physical damage. Symptoms of selenium toxicity include pulmonary edema, cirrhosis and even death. More common selenium side effects include nausea and vomiting, energy loss, changes to the nails and irritability. Long term usage or excessive application can lead to more adverse selenium side effects including poisoning symptoms that can mimic arsenic poisoning including a metallic taste in the mouth and nail inflammation. People have also experienced issues with blood clotting and damage to the liver and kidneys. Selenium side effects have even been linked to infertility in men. Furthermore, there are cases where drug interactions exist when using selenium including interference with blood thinning medications, niacin, those designed to lower cholesterol and some sedatives. Because the only proven applications of using a supplement of selenium is to correct a rare deficiency and likely evidence has only been presented in the cases of cholesterol lowering and Hashimoto’s thyroiditis, it makes little sense to bear the risk of potentially serious selenium side effects. The normal intake for adults is 55 micrograms daily, which is usually attainable via a healthy diet that contains fish and nuts and other food sources. However, it has been designated to be likely safe in treating some conditions for selenium dosage to reach up to 200 micrograms per day in the cases of people using the mineral medically to treat high cholesterol or Hashimoto’s thyroiditis. Regardless, unless a doctor has advised you that you need a supplement for selenium, its best and exponentially less risky to instead opt for a balanced diet that incorporates the correct levels of all of your essential vitamins and minerals and avoid the potentially dangerous interactions and side effects that can be associated with even naturally occurring elements.